"WHY didn't you stop the ride?" They are the words Dave Turner shouted at Dreamworld staff moments after witnessing his wife, brother-in-law and two other people die at the Gold Coast theme park, an inquest has heard. Mr Turner's 12-year-old daughter Ebony had escaped the capsized raft but her mother Kate, uncle Luke Dorsett, his partner Roozi Araghi and another tourist, Cindy Low, were killed. The 30-year-old ride malfunctioned, causing their raft to collide with another and then flip. He had denied previous claims that he pushed the wrong button on his control panel in a panic. David Turner, husband of victim Kate Goodchild, yelled at staff ‘Why didn’t you stop the ride?’ He is seen leaving the inquest last Wednesday. Dreamworld attractions supervisor Sarah Cotter arrived on the scene within seconds of the tragedy and saw Mr Turner's confrontation with staff at the Thunder River Rapids Ride. Ms Cotter told the inquest that in her opinion an alarm button that would alert park staff to an emergency had not been pushed as it should have been. She added that she believed the ride's conveyor had never been stopped by operators. "There was a raft on an angle - for it to be in that position the conveyor must still have been running through all that time," she said. "I don't think it was ever stopped, or (it was) just jammed stopped." 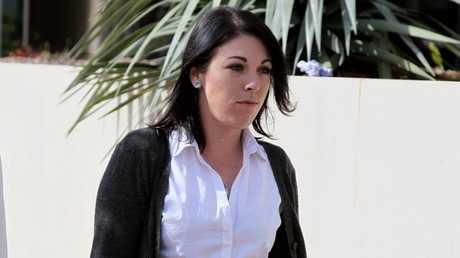 Dreamworld senior ride attendant Sarah Cotter is seen leaving the coroner’s inquest on Tuesday. 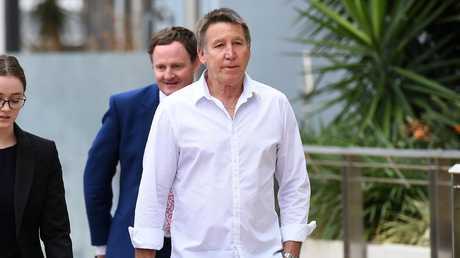 Mr Turner and Shane Goodchild, the father of Mr Dorsett and Ms Goodchild, have already released a statement saying they blame Dreamworld "totally" for the tragedy in October 2016. In a video played to the inquest, Dreamworld training and compliance officer Amy Crisp told detectives during a walk-through at the attraction site she couldn't understand how the tragedy had occurred. "The shut down should have worked … there was time for it," Ms Crisp said. Junior ride attendant Courtney Williams was working in the unload role on the ride for the first time on the day of the tragedy. 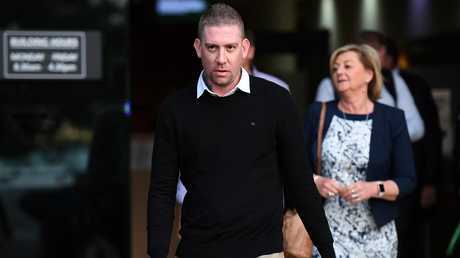 Shane Goodchild, the father of Kate Goodchild and Luke Dorsett, arrives for the inquest. She told the inquest last week she hadn't pushed an emergency stop button near her station because Ms Crisp had told her that morning not to worry about it and "nobody ever uses it". Ms Crisp however told detectives Ms Williams had been told the button stopped the conveyor and she could use it in an emergency. 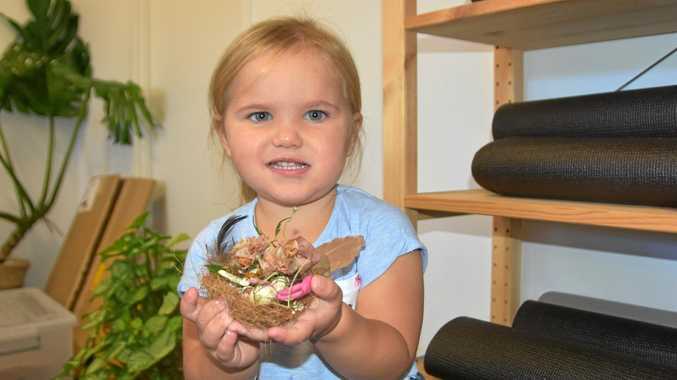 "I know when Courtney is unsure about something," Ms Crisp said. "I trained her on this procedure and I trained her well." Ms Crisp's fiance Michael Stead, who works at Dreamworld in a maintenance role, told police in a statement he believed the park had a "very sound" safety culture at the time of the tragedy. 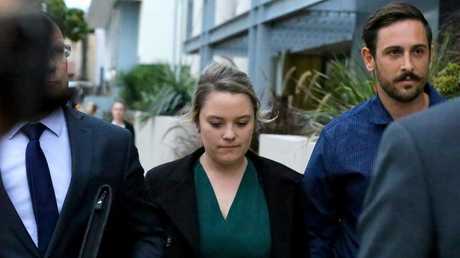 Amy Crisp (centre) and partner Michael Stead (right) leave the coroner's inquest. Mr Stead added the water pump responsible for the malfunction - which had already malfunctioned twice that day - had "good reliability". in the months before a fatal accident. The March 2016 meeting outlined monthly expenditure was $125,000 over budget on a year-to-date basis. "Revenue is up but profit is down, cutbacks are now being enforced," the document stated. "Repairs and maintenance spending needs to stop, only CAPEX (capital expenditure)." Dreamworld's executive made the decision despite a newly appointed safety manager telling the Southport Coroners Court the park's safety systems were inadequate at the time of the tragedy.